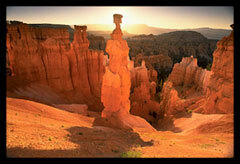 Note this evening, March 5, is First Friday Gallery Night, Image City is open until 9pm. The show, The Three R's, features the terrific photography of Don Race, Sanford Rockowitz, and Steve Rossini who present a diversity of work that ranges from Mount Fuji, to the High Sierra's, and then to Le Mans Classic auto race in France. While they may share a common first letter in their name, they each approach their photography from distict vantage points and interests that we appreciate. In addition, we have a number of guest photographers exhibiting in this show: Julie Oldfield returns to the East Gallery, as well as Bob DiPaola, Jerome Kaye, Susan Kaye, Patty Tauscher and David Wiedmer. We round out the show with Artists-in-Residence, Jim Patton and David Perlman, and Gallery Partners, Daniel P. Crozet, Joel Krenis, Don Menges, Dan Neuberger, Betsy Phillips, Gary Thompson, Phyllis Thompson, Sheridan Vincent, and George Wallace. A total of 22 photographers present a wide-ranging photographic experience. 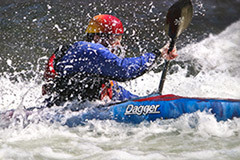 In choosing Don Race's Kayaker, shown at left, Peter commented "This memorable image captures the intimate relationship between the water and the kayaker, and where both he and the photographer are at one with the elements. As we study this print, we all should experience this harmony with the racer fighting the raging water." 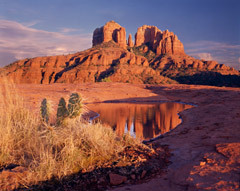 For his second pick, Peter selected Sanford Rockowitz's Thor's Hammer noting "Here, the true majesty of this imposing sandstone structure, namely Thor's Hammer, has been dramatically captured by strong back-lighting and by effectively blocking the sun's rays from impinging on the camera lens. The striking end -result, is an impressive and powerful shadow of the rock dominating the foreground, from which our eyes lead up to take in the incredible color and intricate detail of the 'Hammer' Magically, there is plenty of reflected light to reveal all of the majesty and wonder of the other sandstone elements inside the canyon." Ford GT-40 Mark II. 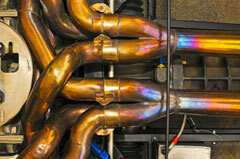 Peter noted that "This view of the exhaust headers of the GT-40 is electrifying in every way. One knows that the twists and turns of the metal pipes are passionately hand-crafted and positioned in order to maximize the thrust and power of the Ford engine. Such highly controlled design also gives an incredible artistic drama and a mysterious aura, as these exotic 'tubes' seem to writhe around, as they seek their own tortuous path to the engine block." Peter next chose Julie Oldfield's Frost, commenting "The tragedy and starkness of abandonment and dereliction have been hauntingly captured in Julie's surreal images. Pictures do provoke visual concern, but they also have a convincing beauty, together with the mystery of a fabled past, coupled sadly with a conflicting and uncertain future. I chose "Frost" as one of my "picks" because it epitomizes all of the above elements, with the added excitement of a serene and majestic red-brick structure." Peter's fifth selection is Sumac Bouquet #8 by Susan Kaye, "Photography is an art of observation, and Susan's delightful and striking images of various leaf structures, eminently attest to her superb artistic and photographic talents. Her outstanding prints, particularly those using macro techniques, wonderfully reveal nature's intimate designs and delicate structures. 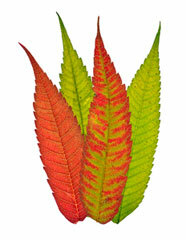 In Sumac bouquet #8, four sumac leaves have been creatively combined into an expressive grouping that emphasizes strong color, and reveals superbly all of the intricate details of each leaf." A few years ago while photographing the Cathedral Rocks near Oak Creek Crossing in Sedona, Arizona I was unceremoniously evicted from an area that I had mistaken for public land. On the hike back to my van I met a woman who was about to enter the trail from which I had been removed. I alerted her that she was about to enter an area that was private land. She laughed and said that everyone walked down that trail to the creek. So, I trudged along a pleasant wooded trail with the woman and her dog named Blue.After about a half mile the path dropped steeply to a redstone plateau with a gorgeous view of the Cathedral Rocks. After expressing my thanks to the woman and petting my new friend Blue, I began surveying the landscape for a good orientation to capture this wonderful scene. The rain pools were fascinating so I ultimately settled down low on the ground at a pool with a prickly pear cactus. The late horizontal light just prior to sunset provided a warm ambience and long shadows for the scene.A great foreground, clear reflections, a beautiful subject and magic light - what else could I hope for? The moral of the story or in this case the "Tip of the Month" is to interact with people in a friendly manner. You will find it pleasurable and sometimes beneficial. Local folks really enjoy sharing their special places with people whom they believe will understand and appreciate their favorite locations. to see a larger image of Rain Pools at Cathedral Rocks and to review the other photographs in the series and the tips Gary has written. March 5, 2010 First Friday Gallery Night, open until 9pm, reception begins at 6pm. March 21, 2010 Last day of The Three R's by Don Race, Sanford Rockowitz, and Steve Rossini.